Offline navigation is now so easy with latest BRouter 1.4.2. Its a joy to use, with all turn instructions automatically calculated and working without trouble. Tap point > Navigate To > go! Thanks Locus team. Roundabouts even shows exit # on the navigation icon. Nice feature. I was in France as a side seat navigator in our Provance/Languedoc car trip last year. I was using OSMAnd offline navigation. I can tell you it is a roundabout hell for navigators. I have realized I would appreciate for large roundabouts something like "Take 4th exit on 8 o'clock". ( like Locus offTrack warning ). As I often failed in exit counting, being disturbed by a traffic , or confused by may-be-exits. But it helped a lot, when I made quick map review in advance that the 4th exit is on 8 oclock. Edit > Once I have seen a terrifying airplane photo of a huge roundabout somewhere in the England. First nightmare for a continental driver is the opposite turning sense. 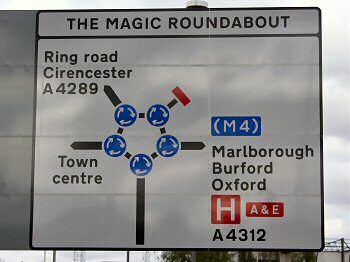 The second nighmare were 5 small roundabouts, connecting 5 junctions to the big roundabout. And the 3rd nightmare was the opposite turning sense of small ones wrt big one. When approaching a large roundabout by bike I just zoom right in and observe map rather than any direction icon. How often do you guys up date brouter and the brouter maps? I update Brouter anytime it is possible. I update the home rd5 file at least monthly, the rest occasionally or if I am about making the routing there. I always update all rd5 files related to area of updated or new vector map. For profiles, it is no relevant, as I use my own profiles.I monitor changes in standard profiles and backport the changes. Note that there are no Brouter maps, rd5 files are stripped down and reorganized OSM data needed for routing, with added SRTM elevation data. To be clear, Locus does not provide BRouter. It's up to you, the user, to occasionally get newer files from the BRouter website. Routing is done with those files, not with maps. If Brouter rd5 files and used vector map are not of the similar date, they may be mutually inconsistent, as the routing may not match the map content. E.g. in one of them a particular road can be closed or oneway,while on the other one the road is free to go. Thanks guys, I was thinking maps when I updated them when I know better. a specific case is monitoring changes of road reparation in a big city commuting context. City biking in the city of Brno in Czech Republic is sometimes a puzzle game. The frequent updating of home country vector map and Brouter data is recommended. Be sure to make an update of Brouter and profiles, if Locus with Brouter does not provide you the navigation instructions at crossroads, but still by the old way at route curves, regardless of crossroads. I am in the process of getting the new data files. By the way, is there a way to save the large zone files dowloaded by Brouter for Backup and re-use purpose ? I have tried to do a simple copy of one of these large files (about 120 MB) and copy it again into the right folder after a fresh install of Brouter 1.4.2 but this didn't work, i.e. Brouter did not recognize the file and asked for a new download. AFAIK there is nothing special with them. It may be corrupted or older version. the only other thing coming to my mind are file access issues with Android 4.4 or higher, see Brouter KitKat survival guide, that partially apply to higher versions as well. I personally download BRouter routing RD5 files by my windows batch file to a windows machine shared folder ( Windows and wget prerequisite needed, but you may download them manually, or make a unix shell script ). It even avoid the download if servers versions are not newer. When downloaded, I copy them via wifi LAN by SyncMe utility directly to my Brouter/segments4 folder ( what you can do manually or by your preferred way ). BTW, they are quite small, area considered, as previous version was near twice as big. Currently Near n20 MB is the largest ones, most are smaller. My way: every night check for update and download from BRouter server (cmd+curl), at phone - every night check for update and download from my WebDAV-server (using FolderSync). So, always actual BRouter data at phone without any my actions. I use web change notification service and run script manually, seeing the change. Sure, I could schedule it as well, but seems to me excessive. :-) Syncme is scheduled or I run it if want it now. The advantage of manual script running is choosing a script just for the tiles I need, not to put unnecessery load on Arndt servers. If I am not going to visit areas Germany or Slovakia in near weaks, I need not their tiles. As I suppose Arndt puts 200 kB/s limit in BRouter client for a reason. Usually, I download just the home tile, the other tiles when I am going to travel to such areas. Wow Evgeny that map is amazing. Two days ago a friend showed us his nice gadget/bikenavi commanded through an app on his IphoneX. The gadget alone was 239 euro's. So I thought: hey, we are long time Locus users (me wife and myself). Mainly used for guiding along hiking tracks, at present from home to Budapest (E3). So let's give Brouter a try. After a couple of hours of getting used to it, she is estatic (as am I). Near prefect navigation on her bike by voice-commands. Only occasionally need to check the screen. Mind you, she is at the lovely age of 63 and for sure not a computer nerd. She now can easily navigte to a point/destination found through "search". Or navigate along a downloaded gpx route from the www. She even has idea's now: if you search by name, like "Wallmart" New York" the result is presented as a street adress. When she chooses to save the navigation track permanently, that adress is used as track name and cannot be changed before saving. She has to do that afterwards in the track list. Only a small inconvenience but hey, any tips? I'm always glad to read, that this little-complicated system found it's users :). Setup of the name when saving permanently ... hmm, will keep in mind, thanks! Btw. we more and more often discuss how to simplify work with BRouter in-app and mainly obtain of data and I'm sure we will come with some improvements here as well.